Dempsey Dyer timber conservatory roofs provide the same benefits as our timber windows and doors, encompassing all three to create a conservatory solution that is tailored to your needs. We manufacture and supply two types of timber conservatories, the Dempsey II and the Petworth, for both domestic and commercial applications. They can be fabricated using Accoya, European Oak, European Redwood or Sapele timber species and are available in a wide range of translucent or opaque colour finishes. We also provide a complete 3D CAD service for both our Dempsey II and Petworth timber conservatories, and reports can be tailored specifically to your project. This process ensures that all parties involved with the project are clear as to what is to be manufactured. Petworth timber conservatories incorporate a drained dry gasket glazing system, with either 7 degree sloped rebated or a concealed drainage channel, for ease of installation and long-term durability. 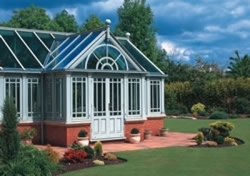 Our skilled craftsmen can also create a full range of mouldings for Dempsey Dyer Petworth conservatories including; pilasters, dential moulding, lead lined timber gutters and decorative carvings.